Since MrLooquer Born some people is using its API but not all of them publish their integrations. Luckily for us there are some tools integrate with MrLooquer. Thanks for use MrLooquer and for share it!! 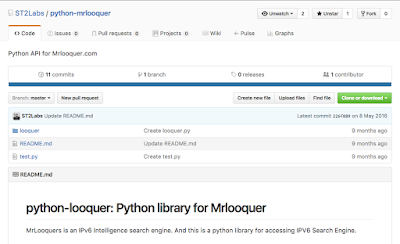 Python library for MrlooquerMrLooquer is an IPv6 Intelligence search engine. And this is a python library for accessing IPV6 Search Engine. Host-ScannerActive/passive network scanner and autonomous vulnerability assessment application. Enjoy this tools and remember if you are using MrLooquer API and want to share it with us do not hesitate to tell us how and where you use MrLooquer.